Slysoft AnyDVD is gone and it’s gone forever because of some legal issues, mostly Blu-rays as what happen to DVDFab. It is really a pity, however, there are still some other programs can work as an alternative to AnyDVD to decrypt and backup your DVDs and Blu-ray discs, among which Leawo is top alternative which, on my option, offers better user interface and more user-demanded features. Leawo DVD Copy can do all AnyDVD do for DVDs: copying the full disc to VIDEO_TS folder or ISO image file and remove all copy protections like CSS and make the DVD region free to be playable on all DVD players. 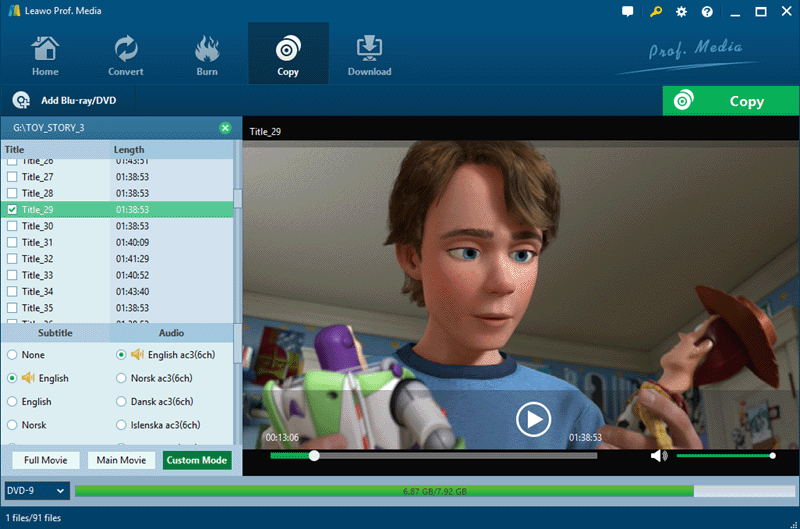 I do think it is one the best AnyDVD alternative because it offers more user-demanded features than Leawo like main movie backup, splitting, merging or cloning. All ways of copying DVDs are fast and offer 1:1 quality or 78% compression to a DVD5 from DVD9s. One of my goal is to be able to copy the DVD onto my computers which is running the latest Microsoft Windows 10 as well as macOS High Sierra and be able to run it with all menus pointing to the correct chapters and titles as if I had just inserted the DVD into the drive. I want to be able to play back with menus as I would expect but from my external storage drive. This is possible with Leawo DVD Copy to create a 1:1 copy on both PC and Mac with menus and all its extra like the original DVD in VIDEO_TS folder or ISO image file as well. Both can be easily played on Windows 10 with default player or my recommended MPC-HC player or INNA for macOS Sierra, High Sierra. If you are not certain how to make this happen, simply follow the screenshot below and select Full Disc in Copy Mode. DVD9 is recommended for the Output as there won’t be any quality loss while maintain the menus like the original DVD. And I have a detailed guide on How to create a DVD copy on HDD with menus like the DVD on Windows 10 macOS Sierra, High Sierra. I know there is a couple of programs that is able to backup DVDs to ISO like WinX and WonderFox, however, it looks like the when I clone DVDs to ISO, the output file the program does is always a 1:1 copy of the entire disc and there is no way to pick options. Specifically, I’d also like to make a backup copy of a DVD into an .ISO file but only want the main movie along with English & Spanish/German Language and English & Spanish/German or forced subtitles (where available) which omitting all other languages (like director’s commentary), subtitles extras and menu. 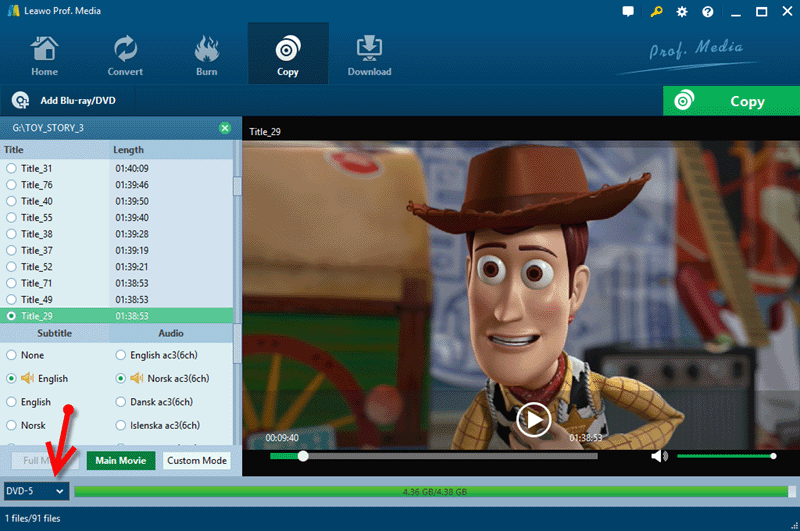 The Copy button lets you save the DVD to VIDEO_TS folder AND ISO file. I mean you are able to save the DVD to a VIDEO_TS folder and ISO image at the same time. I’d prefer ISO! Please note you will lose the menus when you only copy the main movie or custom the backup. Is it possible to copy from DVD to DVD using Leawo DVD Copy in order to play in home DVD Player? 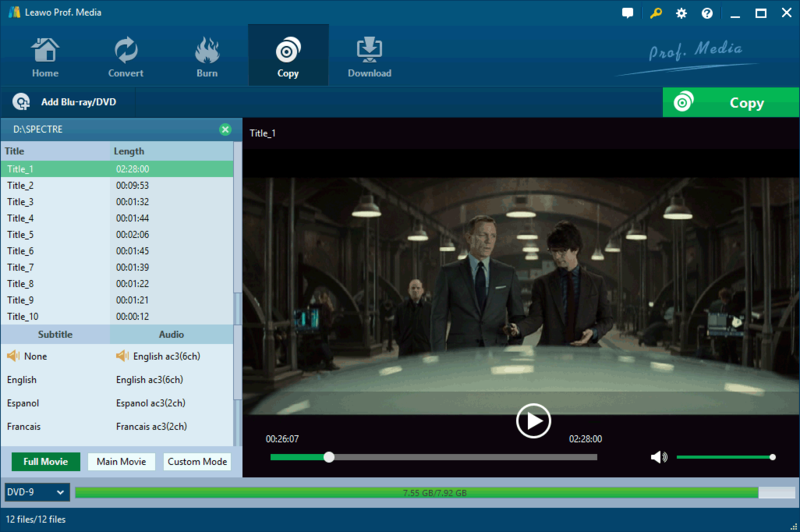 Unlike AnyDVD, this alternative lets you create a copy of original DVD so you don’t have to use free software Burn or payware Toast in order to write from DVD to DVD. I like Leawo better just because it does more than AnyDVD like burning DVD to DVD with region free so you can play DVDs with any DVD player, old or new, Windows or Mac. The Full Movie Mode is 1:1 bit-to-bit copy which is recommended but you are also free to use main or custom mode. If you have only one drive, no worry, the program will remind you to insert a blank DVD when the burning is ready to go. Leawo is an old-brand multimedia solution provider since 2007, providing a wide range of programs in DVD and Blu-ray copying, ripping and creating. Its DVD Copy is supposed to be the best AnyDVD replacement on Windows with all the attractive features mentioned above and it works on macOS as well. It would be 100% perfect alternative for AnyDVD if Leawo can split DVD 9 into two DVD 5. Leawo DVD Copy is sold at $39.95 for lifetime, but you are able to save $9.9 here, which would be much cheaper than AnyDVD as far as I can remember.